A state committee established after last year’s shooting at a Florida high school says North Carolina should place a trained police officer in every school, conduct more rigorous threat assessments, and expand funding for mental health services. The committee, formed last year in the Governor’s Crime Commission, made their recommendations in a new report for Gov. Roy Cooper. Among its recommendations, the panel urged state leaders to fund enhanced mental health training for those school resource officers, or SROs. Officers should also work with schools to prep for an “active shooter” and conduct drills. The committee also backed the creation of gun violence protection orders, offering a legal process to “temporarily remove guns from a dangerous individual,” Cooper’s office said. State Rep. Maria Morey, a Durham judge turned lawmaker, urged legislators to adopt such a proposal last year. 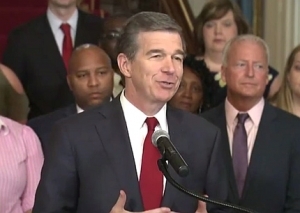 The committee — which included law enforcement, juvenile justice experts, educators and state officials — also urged lawmakers to fund Cooper’s 2018 budget proposal for $55 million in spending on mental health in schools, including cash for more nurses, counselors, psychologists and social workers. 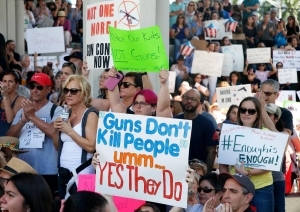 It shares some similarities with a much-criticized report finalized last year by Republican lawmakers in the N.C. General Assembly, including a focus on mental health in schools, although legislators resisted calls to discuss guns during their sessions, instead pushing for greater civic education and first-aid training for students. Meanwhile, the Cooper committee is likely to field criticism from advocates who point to emerging evidence that a greater police presence in schools increases the likelihood that students — particularly Black students — will leave school with a criminal offense that might otherwise have prompted school discipline. School police are also disproportionately called on Black students in schools, data show, feeding what’s referred to by youth justice advocates as the “school-to-prison pipeline,” in which students are siphoned out of schools and into the criminal justice system. Cooper’s panel urged community dialogue on the SRO controversy, as well as specific guidelines for police activities in schools and improved data collection of school violence. The committee began its work last spring, holding five public forums in Greenville and Greensboro. It was co-chaired by Gaston County Sheriff Alan Cloninger and former Wake County Sheriff Donnie Harrison. Absolutely. School nurses should be on premises when the first student arrives and when the last student leaves. *Not to include after school activities. LEO also. A Social Worker should be assigned to every school also and added when needs are greater.